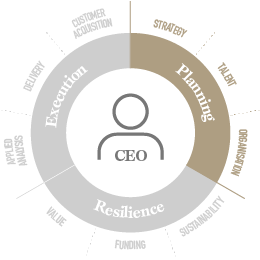 At Frog, we have created a unique methodology to support our CEOs through the challenges of the scale-up phase. The requirements for good leadership for a scale-up CEO are not the same as they are for the founder of a start-up, and a crucial difference will be the degree of focus on planning. We know from experience that maintaining growth as the challenges multiply requires more than just hard work; planning ahead becomes vital. The scale-up phase will bring many new challenges as the requirement to deliver the same service quality to multiplying customers stretches execution capabilities. We have been through this process many times, for some of us at the coalface in executive roles, and can provide the expertise to alleviate the pain through providing the support of the Scale-up Methodology. What is the received wisdom on planning and what is it about our approach that’s different? Too often planning is ad hoc and vague, something to tick a box to be able to say it’s done but then never spoken of again. In the day to day struggle, planning can easily become tactical and short term, an extension of execution rather than a periodic process of review and preparation for the future. The Scale-up Methodology has three elements to the planning phase; Strategy, Talent and Organisation. We see this as an iterative cycle where clarity of strategy is both supported and informed by investment in talent and organisation. Frogs’ definition of strategy: “A competitive game-plan to achieve an important goal”. Further clarity comes from Good Strategy / Bad Strategy by Richard Rumelt: “Good strategy is not about vision or goals. It is a carefully researched and well-thought-out action plan designed to meet a challenge.” Particularly during the scale-up phase, where a degree of product market fit has already been established, strategy is not about selling a vague market opportunity but rather combining a clear view of addressable market with a robust plan of action as to how this can be exploited. More importantly, identifying the unique resources and attributes your company has (and will need) to thrive in that environment. We use standard approaches such as Porter’s 5 forces but have also commissioned original work on strategy assessment. These are combined in our scale-up methodology, informing both our deal assessment and portfolio support. Talent is where planning and execution intersect. Good people will of course help you to execute better, but if they have the right quality and seniority they will also be involved in shaping strategy through bringing challenging views to planning sessions. At Frog, we emphasise the importance of building out the senior team proactively to support the CEO as the role changes. We champion developing a culture, organisation and HR approach to nurture and continually assess talent at all levels. As a CEO, your optimal team for the job will change over the quarters. Recognising this fact is essential, as is having an approach to assessing performance, addressing competence gaps and spotting early the need to make a step change and take tough people decisions. A strong senior team is essential to share the burden of responsibility for seeing and delivering the vision that can otherwise become oppressive on the CEO. Increasing senior bench strength should not be considered an optional extra awaiting the functional need to be critical (see our CFO blog). Through experience we know what good looks like across the C-Suite roles and through our management due diligence processes we agree with the CEO where the team gaps are both in functional expertise and personality traits. Many businesses we back will justifiably be light on HR processes as they have negotiated the start-up phase in an effective, lean manner. Through scale-up, we know that best practice HR processes, like planned recruitment, training and development and performance management, have a huge return on investment both in time and money saved. We believe that the HR function should sit alongside finance, operations, sales and technology/product as a core business function. Good organisation starts from the top and changes in the board are likely to be the most obvious initial differences when growth capital is taken on. Whilst we add value through our Frog representative on the board, we also encourage a wider review of what skill sets are required (for a new chairman for example) at that level and what the processes should be. The board should be a huge asset to the business and where this isn’t the case, you either have the wrong people on it or you aren’t getting the best value out of them. Good board governance should drive better value add from the board and requires a distributed agenda, informative and consistent board pack, minutes actions assigned and followed up regularly. The board should not be a reporting meeting or presentation to investors but rather focused on what drives the business performance and value creation and always forward looking. Governance and Risk by George Dallas states that: “Empirical analysis demonstrates that there is a correlation between governance and performance,” but governance must be bespoke, principles must be tailored to the company, the market and the circumstances. At the executive level, organisational clarity drives business discipline and accountability through all levels, ensuring a consistent approach of rigorous follow-up on previously set targets or projects. This is not about blame but learning and improving. Should you have a global Chief Revenue Officer or two regional leaders? What is the exact role difference between your Chief Product Officer and your CTO? When should you hire a CMO, and what profile? A clear structure of departmental and interdepartmental accountabilities and meetings each with their own clear objectives and process allows better delegation and decentralised control, releasing the capacity to scale-up that top down micro-management inhibits. Delegation without organisation risks uncoordinated or even conflicting agendas and activities but organised delegation is a fundamental part of scaling up.